Here are the best Los Cabos beaches close to Cabo San Lucas and San Jose Del Cabo, that are ideal for all types of beach goers from families to watersport enthusiasts. Two of the more iconic beaches are Playa del Amor and Playa Divorcio which are perfectly situated on the Land’s End Peninsula in a picture postcard environment. You will find perfect swimming and snorkeling conditions at Playa Palmilla as well as at Santa Maria Beach which boasts a marine sanctuary and Chileno Beach boasts a Caribbean style environment with swaying palm trees. For beach goers who want plenty of watersport adventure the vibrant Medano Beach is splendid and there is plenty of nightlife in the evening. If you are a surfer then Playa Costa Azul is superb with the Zipper as well as La Rocca reefs along with an energized party scene along the shoreline. 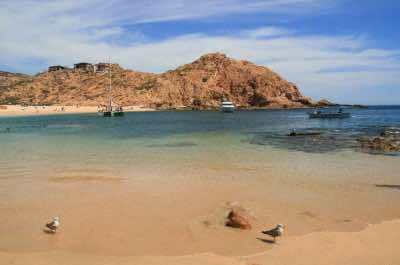 Scorll down for the map to locate these fabulous beaches in Los Cabos. One of the most beautiful Los Cabos beaches that is perfect for all type of beach goers including families is Chileno Beach also known as Playa Chileno. Located within the tourist corridor between Cabo San Lucas and Cabo del San Jose at kilometer 14.5 along Highway 1, Chileno Beach is a Blue Flag Beach that offers a gorgeous horseshoe shaped stretch of sand along the shoreline of Chileno Bay. Chileno Beach boasts ideal conditions for swimming as well as snorkeling which is created by the offshore reefs that protect the Chileno Bay. Snorkelers will find an abundance of marine life from eels to colorful fish to sea turtles to starfish. The setting is quite stunning with plenty of solitude and palm trees as well as palapas to be found which makes for an enjoyable time lounging on this picture perfect beach. To beat the crowds get there early in the morning or visit on a weekday and you will need to bring what you need for the day as far as a picnic and watersport equipment. You will find restrooms onsite at Chileno Beach but very little vendors. When you want to visit the most iconic Los Cabos beach that has postcard type scenery and is ideal for all types of activities then you should go to Playa del Amor also known as Lover’s Beach. Located along the Land’s End Peninsula, Playa del Amor overlooks the Sea of Cortez and is only accessible by water taxi (panga), glass bottom boat or kayak. Playa del Amor has a perfect stretch of sand that is surrounded by 30-million year old eroded granite rock formations which creates an idyllic setting for paradise. Playa del Armor is ideal for a picnic and the waters on the Sea of Cortez side of the Land’s End Peninsula are generally safe for swimming as well as snorkeling when you take precautions. There area is simply gorgeous with perfect views of Medano Beach, Cabo San Lucas and El Arco with splendid photograph opportunities from the majestic granite rock formations. Playa del Armor can get busy in the afternoon with tour groups stopping for short periods of time so the morning is best. You will need to take everything you need for the day because there are no facilities located at Playa del Armor. When you are searching for a secluded Los Cabos beach that is ideal for snorkeling, scuba diving and swimming then Santa Maria Beach is a perfect choice. Located within the tourist corridor between Cabo San Lucas and San Jose del Cabo at kilometer 12 along Highway 1, Santa Maria Beach is an incredible horseshoe shaped Blue Flag Beach which is surrounded by superb rock formations and features a protected marine sanctuary within the bay area. Santa Maria Beach offers ideal conditions for snorkeling and scuba diving with many offshore sites that are packed with hundreds of colorful fish and marine life such as sea turtles. You will find plenty of space on the beach to relax and enjoy the sounds of the gentle lapping waves. You won’t find many people at Santa Maria Beach during the week but for optimal solitude the morning is the best time to visit before the snorkeling excursions arrive. The beach area has basic facilities such as restrooms as well as vendors with snorkeling equipment during the winter months so come prepared with an umbrella and a picnic. If you are looking for a great Los Cabos beach that offers perfect swimming conditions and is ideal for families then you should take a trip to Medano Beach also known as Playa el Medano. Located near the harbor in the heart of downtown Cabo San Lucas, Medano Beach boasts a great 2-mile stretch of golden sands where you will find all the amenities you need for a fun filled day or night. Medano Beach is the most popular beach in the Cabo San Lucas area with perfect swimming conditions in Cabo Bay and you can enjoy views of El Arco as well as Land’s End while lounging on the sand. Medano Los Cabos beach sports several small beach bars and the coastline is lined with splendid restaurants as well as shopping venues. You will be able to rent an assortment of watersport equipment from kayaks to standup paddleboards and there are plenty of onsite vendors with jet skis, parasailing adventures as well as flyboarding. Medano Beach is not just for the daytime with a vibrant nightlife scene every evening with many nightclubs boasting live music and Mexican fiestas as well as fireworks on selected nights. If you are trying to find a perfect Los Cabos beach for a family which boasts plenty of watersport activities then you need to go to Playa Palmilla also known as Palmilla Beach. Located 1.5-miles south of the hotel zone of San Jose del Cabo at kilometer 27 along Highway 1, Playa Palmilla has been designated a Blue Flag Beach and offers a 1-mile stretch of beach that sports a few palapas, a small boat launch area as well as a safe area for swimming. 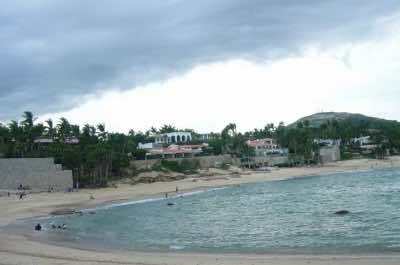 Playa Palmilla has calm water that is created by a rocky point offshore which provides protection which offers perfect swimming and snorkeling conditions throughout most of the year. During the winter months Playa Palmilla is a popular spot for whale watching while relaxing on the sand. Fishermen have used this beach over the years which make renting a panga or small boat very accessible and surf fishing is quite good near the south rocky point area. There are limited food and beverage options and no facilities at this beach so you must come prepared if you plan on spending a full day. When you are seeking some great waves to carve or just want to relax and watch some surfers then an ideal Los Cabos beach for you is Playa Costa Azul also known as the Blue Coast Beach. 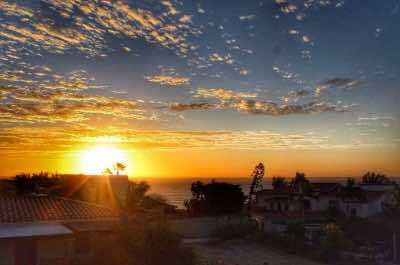 Located 2-miles south of the hotel zone in San Jose del Cabo along Highway 1 at kilometer 28, Playa Costa Azul is a popular 1-mile stretch of beach which changes throughout the year but surfers can take advantage of two famous wave breaks known as the Zipper and La Roca year round. 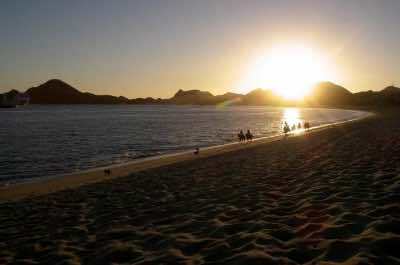 During the winter months Playa Costa Azul boasts good swimming and snorkeling conditions when the water is calm. In the summer months surfers flock to this area because the Zipper has an incredible right hand reef break that is ideal for expert or advanced surfers. Surfers also take advantage of the challenging La Rocca break and beginners will be thrilled with the Middle break. Playa Costa Azul offers plenty of services including surf lessons as well as numerous restaurants where you can find a palapas or a cold drink. One of the best times to visit Playa Costa Azul is during June when the World Surf League hosts an annual event. If you are searching for a Los Cabos beach that is secluded with plenty of space to lounge on white sand then you should plan a trip to Divorce Beach also known as Playa Divorcio. Located a short distance the famous Lover’s Beach, Divorce Beach is only accessible from the water by water taxi, glass bottom boat or by kayak. Divorce Beach has a splendid stretch of beautiful white sand for you to enjoy and stellar rock formations enclose this gorgeous piece of sand. Divorce Beach is a unique place because the sands touch not only the Pacific Ocean but the Sea of Cortez and is one of the few beaches in the world that touches two independent bodies of water. Because of this phenomenon the water here has strong rip tides and unpredictable currents making swimming impossible and you are advises not to go swimming at Divorce Beach. 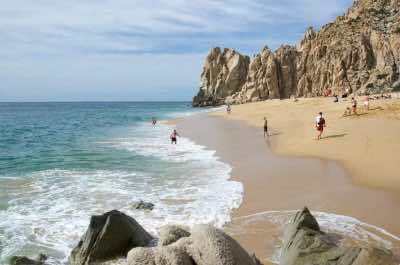 Once at Divorce Los Cabos beach you can climb the rock formations away from the waterfront for great panoramic views and whale watching during the winter months is usually very good. You will need to bring provisions for the day because there are no facilities at Divorce Beach including lifeguards.